“Having three live chicks is like winning the lottery!” – John Perkins. Photo: John Perkins. Twenty-five years of volunteering with conservation group Friends of Durras to protect endangered shorebirds is “enough to drive you to drink!” says John Perkins with a hearty laugh. Working independently since 1994 and in cooperation with the National Parks and Wildlife Service (NPWS) since 1999, volunteer groups along the coast of NSW have battled the weather, predators and human behaviour to protect endangered species of shorebirds such as Pied Oystercatcher, Little Tern, and Hooded Plover. Volunteers and Parks staff watch over eggs first and then the chicks for the duration of the breeding season every year – for approximately six weeks from early November to early December, when the baby birds fly. It’s hard work for small rewards that nevertheless add up to the survival of a species – in his time as a volunteer, Perkins has seen only 40 individual Oystercatchers fledge. “Oystercatchers mate for the first time when they are about seven years old,” Perkins says, explaining the timeline volunteers are working with. 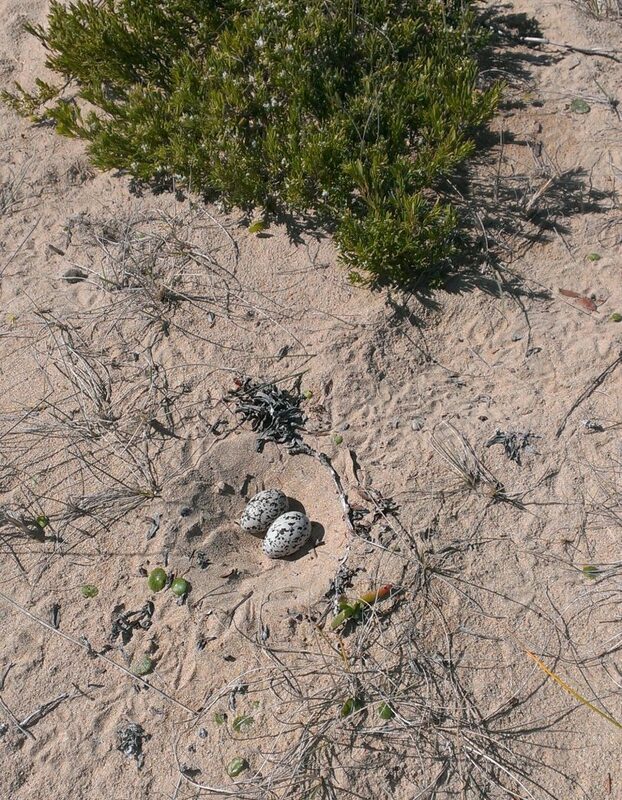 Volunteers and NPWS watch over eggs first and then chicks for the duration of the breeding season every year – for approximately six weeks from early November to early December. Photo: John Perkins. Despite improvements in technology and increased public awareness since the program’s inception, the rise and fall of each species population still presents enough puzzles to keep Perkins and other volunteers frustrated – and hooked. 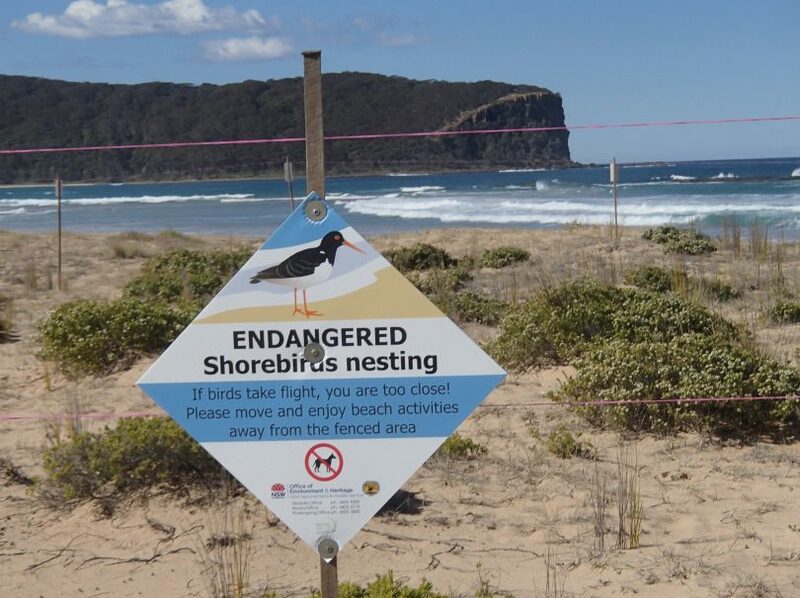 NPWS Shorebird Recovery Planning Officer Sophie Hall-Aspland says that there are fewer than 70 Hooded Plovers, 250-300 breeding pairs of Little Terns and 200 pairs of Pied Oystercatchers in NSW. The birds are only on beaches for a short time and after they fly, there are a lot of unknowns, Hall-Aspland says. Now, in the last few weeks before the birds fledge, volunteers take it day by day, Perkins says, building fences around known nesting sites and monitoring the birds via remote camera and in person. “Every day they survive they are closer to fledging. It can be soul destroying when a chick is killed close to fledging. 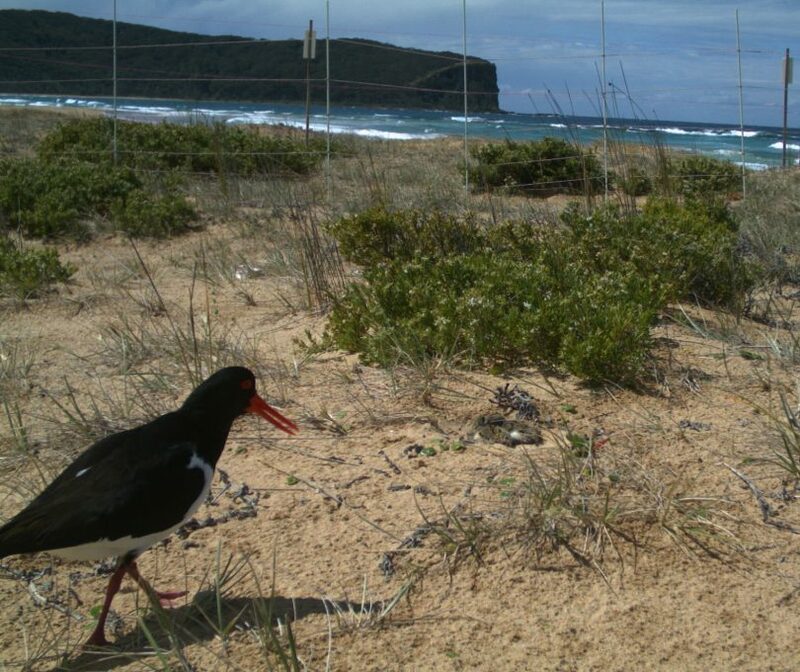 It represents about 300 hours of volunteer time as well as the loss to the species” Perkins says of the five Pied Oystercatcher families he is watching over in Durras. 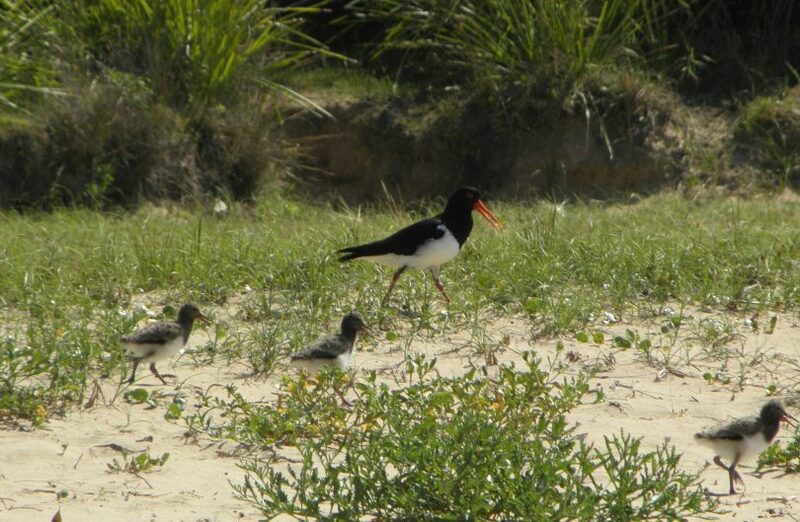 A Pied Oystercatcher returns to the nest. There are fewer than 70 Hooded Plovers, 250-300 breeding pairs of Little Terns and 200 pairs of Pied Oystercatchers in NSW. Photo: John Perkins. Sometimes electric fencing is used to keep out predators such as dogs or foxes, and occasionally it’s all hands on deck to fill sandbags to keep a high tide from claiming precious eggs. But most of the work is in observing the birds, says Mogareeka-based volunteer Nadia Padden, in order to identify new nests quickly and take steps to protect them. 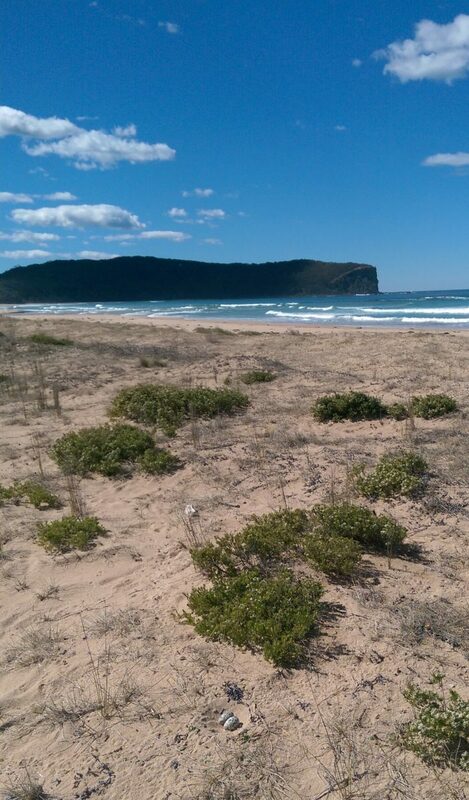 Padden stumbled upon the shorebird protection program after upsetting changes in her life landed her in the dunes near the Tathra river mouth. “I was broken-hearted,” Padden says. Padden watched Leo Berzins, a longtime volunteer who lives in Merimbula, put the first fence post of the season in the ground three years ago and has been involved ever since. “Watching how committed Leo and the other volunteers are has led me to a passion for birds. I love observing the birds because I’m so present, it’s healing” says Padden. Although ground-nesting birds are vulnerable to animal predators such as foxes, cats, snakes and goannas, the biggest threat to these bird populations is humans and domestic dogs. Photo: John Perkins. Figuring out where the birds are nesting can be quite a trick, explains Hall-Aspland, as shorebirds have evolved to either conceal their clutches in vegetation (like sandpipers) or nest in open habitats (like plovers, and oystercatchers) but use tactics to confuse or deter predators from the nests. Oystercatchers, for example, make a small scrape in the sand in which to lay their eggs but may make many scrapes before laying eggs. The public can help volunteers by being observant while out and about on beaches and inlets. Watch for birds that are running, swooping or calling out, Padden advises, and if you see these signs, you are likely too close to a nest or nesting site. Looking at a picture of a mother Oystercatcher with three chicks, Perkins adds that a dog in the dunes could crush the chicks in no time. Volunteers may have big years or low-key years depending on where they live. Terns are a colony species, explains Hall-Aspland, and nest in different areas every year. “We are hoping to see 80-100 Little Terns this year,” Padden adds. The shorebird recovery program is always in need of more volunteers. Although ground-nesting birds are vulnerable to animal predators such as foxes, cats, snakes and goannas, the biggest threat to these bird populations is humans and domestic dogs, says Hall-Aspland. Padden was looking for nests in mid-November this year and saw a speckled Oystercatcher egg laid in the shallow indent of a human footprint. “That’s how fragile they are,” Padden says quietly. Hall-Aspland says the program always needs more volunteers and welcomes people of all ages. To get involved go to the shorebird recovery program website. Original Article published by Elka Wood on About Regional.